Harold Rex Interfectus Est: "King Harold was killed". 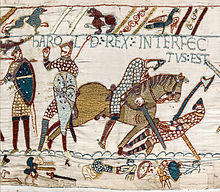 Scene from the Bayeux Tapestry depicting the Battle of Hastings and the death of Harold. شابلون:Campaignbox Norman Conquest خطای لوآ در ماژول:Location_map/multi در خط 143: Unable to find the specified location map definition. Neither "Module:Location map/data/United Kingdom East Sussex" nor "Template:Location map United Kingdom East Sussex" exists. اینگیلیسجه ویکی‌پدیاسی‌نین ایشلدنلری طرفیندن یارانمیش«Battle of Hastings»، مقاله‌سیندن گؤتورولوبدور. ( ۲۸ سپتامبر ۲۰۱۸ تاریخینده یوْخلانیلیبدیر). قارداش پروژه‌لرده هاستینقز دؤیوشو گؤره داها آرتیق بیلگی‌لر تاپابیلرسینیز.